Reshard Munroe signed by the Cincinnati Reds on July 5th, 2014 as a free agent. Along with his teammate Quinton Rolle; They played in the Dominican Summer League in 2015. Finally a chance to play minor league baseball with The DSL Reds. In July 2015 that saw him play in 51 games, with 177 at-bats whiles collecting 44 hits for a .249 batting average. Reshard started his 2016 season in the Arizona League, with The AZL Reds. Playing in 21 games, with 51 at-bats and eight hits. On January 31st, 2016 He was critically injured that was life threating, the whole community rallied around the Munroe family in support. And with a praying mother and father, a mother who is a worship leader and loves God; Soon there was prayer going on for Reshard while he was in surgery. We heard about the miracles in the operating theater. And as a result; We saw Reshard making it out of the hospital by January 7th, 2017. One month later Reshard Munroe was off to rehab at the Reds spring training facilities in Arizona. He had to stretch the scar tissue so he could have full mobility in his right arm because of the scar on his right chest from the surgery. Expecting to break 2017 camp with the Dayton Dragon, because he came out of rehab quickly but was only able to get in 2 at-bats in spring training. Eventually, he had to stay in extended spring because he had fewer at-bats than everyone, plus the Reds didn’t want to send to Dayton because they weren’t sure his body could take that move as yet. Reshard pushed himself through rehab, because he was not supposed to play until the end of April and ended up playing at the end of March he said. Reshard said that the process wasn’t too hard for him in rehab; Because of his determination to play the 2107 season. In which he did, playing in the first game for the AZL Reds that saw him with a pinch-hit single; And in his second game 3 for 4. Reshard finished up the 2017 season, with 124 at-bats with 36 hits for a .290 batting average. Five doubles, one triple, and 3 home runs, and On Base Percentage of .401. Reshard Munroe Dayton Dragons. Photo by Mathew Carper. 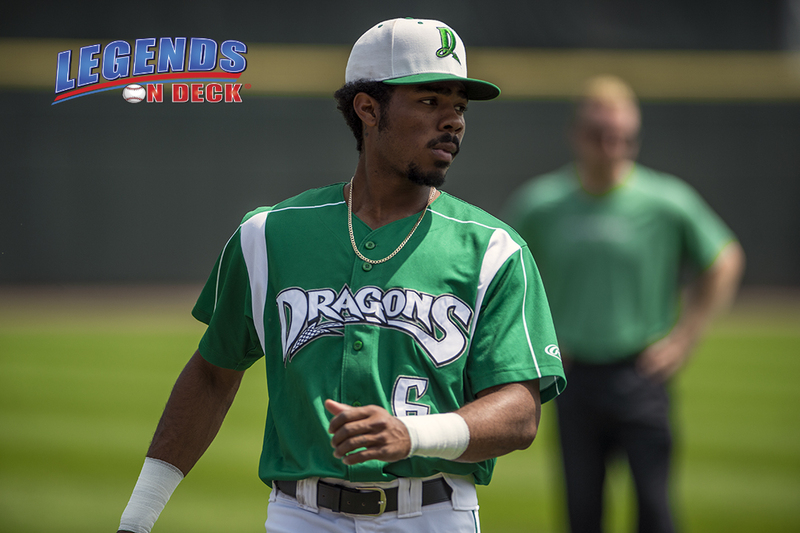 On June 14th, 2018, Reshard was sent to the Dayton Dragons, the Reds Single-A team in the Mid-West League. Before playing in his first game of the 2018 season against West Michigan Whitecaps, going 1 for 2 with two walks. Two stolen bases and one run scored. However, after one game with the Dragons, He was sent to the Rookie Pioneer League Billings Mustangs, on June 16th, and started playing on the 20th, where he went 3 for 7 in the doubleheader games. Eventually, Reshard returned to the Dragons on July 25th, after playing well for Billing, going 31 for 99 for a batting average of .313 in 28 games, five doubles, three home runs and a .387 On Base Percentage. After returning to the Dragons, where he played in 32 games, going 19 for 99, three doubles, two triples, and three home runs. Finishing the 2018 season with 60 games played, with 50 hits in 198 at-bats for a batting average of .253, eight doubles, two triples, six home runs and an On Base Percentage of .341. Reshard’s swing at Don’t Blink Home Run Derby Photo by Trevere Saunders. Even though Reshard struggled in Dayton; The season was big for me, Reshard Munroe said. There were some very good moment and games. Therefore he is looking to building on them next season. Finally, after working on some adjustment in instructional league, he is home for the offseason. Up next for Reshard is 2019 Don’t Blink 242 Home Run Derby in Paradise. We hope to see you here also for the Derby.